This post is an overview about Qbrexza, a new hyperhidrosis drug that recently got approved by FDA. I have reached out to the parent company (Dermira Inc) to get more details and will update this post with more details as/when they choose to respond me. Scroll below for an email interview with company representatives to know more details on the drug. 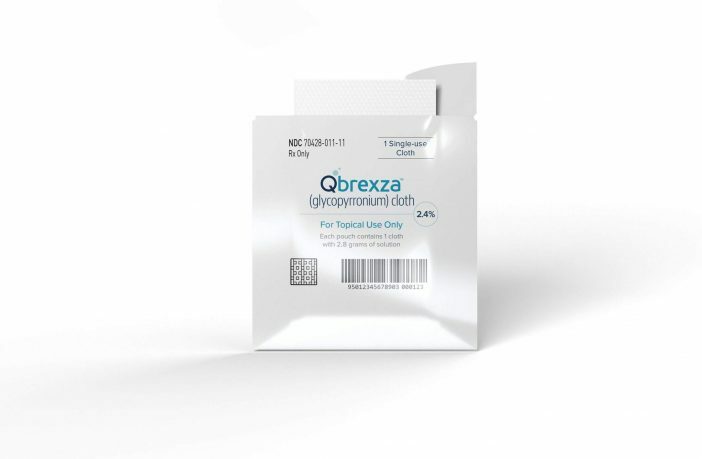 Qbrexza is a prescription anticholinergic medicine used on the skin (topical) to treat excessive underarm sweating (primary axillary hyperhidrosis) in adults and children 9 years of age and older. The active compound in Qbrexza is Glycopyrronium. The active ingredient Glycopyrrolate is same as that in the oral drug Robinul. The exact mechanism is complicated, but this compound belongs to the Anticholinergic agent category which inhibit the normal nerve impulses. This action reduces the secretions of certain organs in the body. Glycopyrrolate helps to control conditions such as peptic ulcers that involve excessive stomach acid production. Glycopyrrolate is also used to reduce drooling in children ages 3 to 16 who have certain medical conditions, such as cerebral palsy. Qbrexza – Who should not use? Here's the email interview I did with the company. Note that some of the responses are less illuminating than what I'd have liked, but I guess its easy to understand why Qbrexza folks won't want to give those answers due to legal/marketing related issues. I have added my comments (HHN translation) which may be helpful in breaking the code! What is the unique preposition of Qbrexza? QBREXZA is the first topical prescription cloth approved to treat primary axillary hyperhidrosis, also commonly known as excessive underarm sweating, a chronic skin condition that results in sweating beyond what is needed to regulate normal body temperature. As you know, the exact cause is unknown. QBREXZA is a topical anticholinergic cloth designed to block sweat production by inhibiting sweat gland activation. QBREXZA is designed to block sweat production by inhibiting the interaction between acetylcholine and the cholinergic receptors responsible for sweat gland activation. How is Qbrexza different from pad based anti-antiperspirants (e.g. Sweat Block) in terms of effectiveness, or cost? 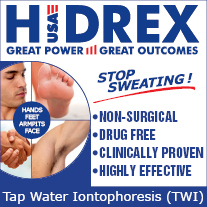 QBREXZA is the only FDA-approved topical prescription cloth approved to treat primary axillary hyperhidrosis. QBREXZA was not studied as a comparator to existing treatment options available to patients over-the-counter. We have not disclosed the price of QBREXZA but intend to do so prior to the therapy’s availability in October 2018. HHN Translation: Not really an answer. In my view, Qbrexza is not an antiperspirant unlike Sweatblock etc. Antiperspirants work by blocking the channel through with sweat gets on the skin, while Qbrexza seems to work by blocking the nerve signals themselves. How is Qbrexza different from Robinul which has same active ingredient? The active ingredient for QBREXZA is glycoprronium. As you know, the FDA has not approved any other anticholingerics to treat primary axillary hyperhidrosis. 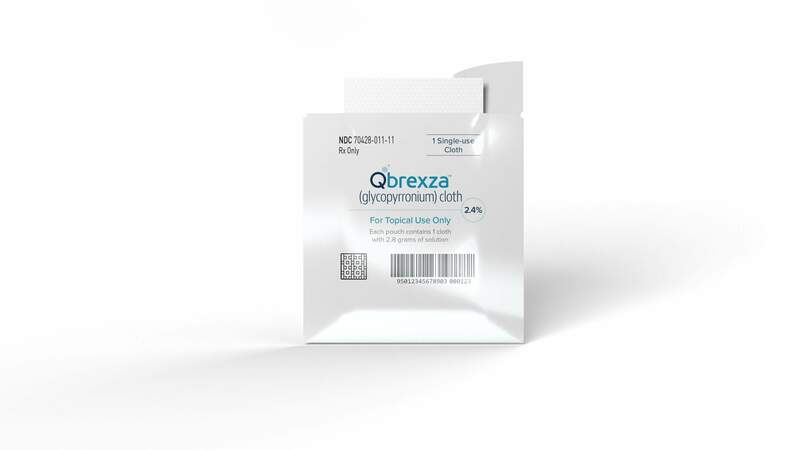 QBREXZA is a single-use medicated prescription cloth approved for topical administration to treat axillary hyperhidrosis. 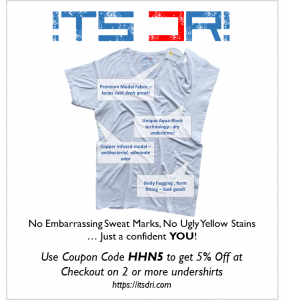 HHN Translation: Robinul is oral drug, and thus reduces sweat production in general. Qbrexza is more targeted towards underarm region. How is Qbrexza different from MiraDry in terms of effectiveness, or cost? QBREXZA was not studied as a comparator to existing treatment options available to patients, including devices such as MiraDry. We have not disclosed the price of QBREXZA but intend to do so prior to the therapy’s availability in October 2018. HHN Translation: MiraDry works by destroying the sweat producing glands in the underarm region. Qbrexza works by blocking the nerve signals. MiraDry can be permanent cure, while Qbrexza is temporary relief. We have not disclosed the price of QBREXZA but intend to do so prior to the therapy’s availability in October 2018. Dermira is committed to ensuring access to QBREXZA for people who suffer from primary axillary hyperhidrosis. HHN Translation: Not an answer really. I will update this space once they release more information in pricing. QBREXZA can be prescribed by a licensed healthcare professional who is authorized to write for prescription treatments. For example, this includes dermatologists, pediatricians, primary care physicians and nurse practitioners with prescribing privileges. What should patients ask their doctors to get Qbrexza prescription? Patients who believe they may have primary axillary hyperhidrosis should contact their doctor to discuss their symptoms. As you know, the onset for primary axillary hyperhidrosis is during adolescence. In some cases, patients may have been diagnosed at an early age and may have initially sought treatment (but discontinued if the condition did not improve), may be on another treatment (that is providing relief) or could be been managing the condition without any treatment. A dermatologist will be able to help a patient understand if they have primary axillary hyperhidrosis and determine if QBREXZA is right for that patient. Where can patients get free samples from (if they can)? Dermira is offering a sampling program for QBREXZA. Doctors can request samples of the therapy from a local Dermira representative or via an online portal. Is there any special financing plan / discount/ scheme available to reduce cost or to get free samples? Dermira has not yet announced the price of QBREXZA. We intend to do so prior to the availability of the therapy in October. We are committed to ensuring that patients who need QBREXZA, have access to the therapy. Doctors will be able to offer samples of QBREXZA to their patients. Availability – is it available pan USA? What about other countries? At this time, our primary focus is launching QBREXZA in the U.S. We recognize that primary axillary hyperhidrosis is a condition that affects millions of people around the world. Dermira may consider seeking commercial approval for QBREXZA or exploring partnership opportunities in countries outside the U.S. in the future. For example, Maruho, a Japanese-based dermatology company, has licensed the treatment, which is currently being developed for the treatment of primary axillary hyperhidrosis in Japan. What are the various SKUs to get Qbrexza in? QBREXZA is supplied as a carton of 30 individually wrapped cloths. Samples of QBREXZA will be offered in a five-day supply, with five individually wrapped cloths. Why do you believe Qbrexza should be the preferred treatment method for underarm area? QBREXZA represents an important new treatment option that we believe will help meet the needs of people suffering from this medical condition. QBREXZA is the first and only FDA-approved topical cloth therapy approved to treat primary axillary hyperhidrosis. The approval of QBREXZA is based on data from two Phase 3 clinical trials conducted in patients (9 years of age and older) with primary axillary hyperhidrosis. Other than Botox, QBREXZA is the only therapy that has clinically tested for this condition. Based on the results, we believe that QBREXZA can provide meaningful clinical benefit for patients living with this condition compared to the current treatment options available. HHN Translation: We'll need to wait and watch the drug in action to see if it delivers. In clinical tests, it seems to have done well and demonstrated results. Why did you guys use such a difficult to pronounce name?!! Any interesting story behind the name? As you may be aware, the FDA has a process that all companies seeking to bring a new therapy to market must go through in order to identify a commercial brand name. Dermira provided the FDA with a small group of potential names. Those names were then compared to the names of other therapies on the market that might be similar those we provided. QBREXZA was ultimately selected ensuring that the appropriate degree of differentiation existed from other therapies on the market. We hope over time the name will roll off the tongue — kew brex’ zah. HHN Translation: Its just a name that was available, and FDA liked!